View More In Chef's Pans. Hard anodized exterior - harder than stainless steel. Dense, nonporous, and highly wear-resistant for Extra durability and professional performance. 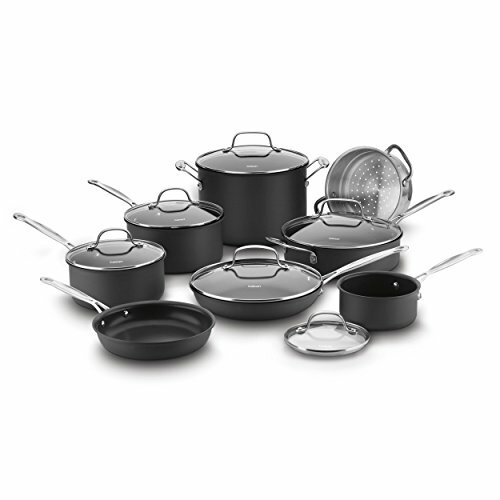 QuanTanium non-stick interior - premium nonstick surface reinforced with Titanium provides lasting food release. No oil or butter needed for healthier low-fat cooking options, and easy cleanup. Oven safe to 500 DegreeF. Glass lids are oven safe to 350 DegreeF. Cook in oven or on stovetop. If you have any questions about this product by Cuisinart, contact us by completing and submitting the form below. If you are looking for a specif part number, please include it with your message.